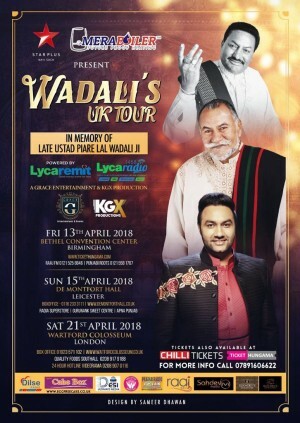 Grace Entertainment presents the pride of Punjabi and legends of Sufi Singing – The WADALIS – Padam Shree Ustad Puranchand Wadali and Ustad Piyare Lal Wadali are Sufi singers and musicians from Guru Ki Wadali in Amritsar District of Punjab, India. Born into the fifth generation of musicians given to singing the messages of Sufi saints, the Wadali brothers dabbled in the most unexpected of professions before they became Sufi singers. Lakhwinder Wadali – Belonging to the famous Wadali family, Lakhwinder Wadali has a unique blend of classical and contemporary styles, which brings freshness to Punjabi music. Trained extensively in the art of singing under the tutorship of his father Padam Shree Ustad Puranchand Wadali and uncle Ustad Piyare Lal Wadali Alaaps and Taans are the vital aspects of his music. He holds his audience spellbound with his lyrical flow of Punjabi music. Trio is performing together in UK for the first time ever and are all set to overwhelm audiences in a purely melodious musical night performing with a 8 piece band. The Tour which commences on the 6th of April 2018 from London Watford @ Watford Colosseum will be followed by Bethel Convention Centre on 7th April 2018 in West Bromwich in Birmingham city and conclude with Demontfort Hall in Leicester on 15th April 2018.